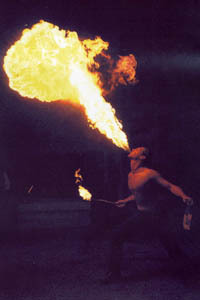 David Roman, The Human Dragon, has been a participating member of the Cirque de Flambe since the summer of 2000. Like many of the great Fire performers around him, David started smoldering slowly–as part of fire safety–dodging roman candles in the deep desert. Vowing not to let any opportunity pass him by, he spent his first joyous year with the Cirque de Flambe as a student (you would be amazed to know some of the things we have to learn to survive). David's growing repertoire of skills include staff, fans, clubs, fire eating, and fire breathing, which he has been doing for over four years. These varied events have led to the development of his most prominent stage character, The Human Dragon.